Manufacturing output in the UK recorded a surprise fall of 1.3% in May, the biggest decline since January 2013. The figure from the Office for National Statistics (ONS) was much weaker than economists’ forecasts of an increase of 0.4%. Manufacturing data and surveys so far this year have indicated that the sector is growing robustly. 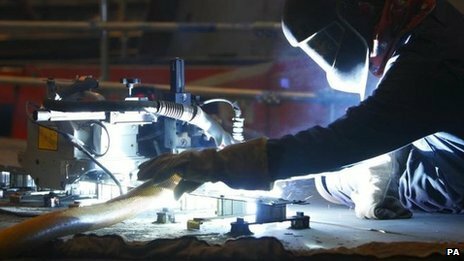 The wider measure of industrial output also fell in May, the ONS figures showed, dropping by 0.7%. Compared with a year earlier, manufacturing output was up 3.7% in May, down from April’s increase of 4.3%, while annual growth in industrial output slowed to 2.3% from 2.9%. May’s decline in output echoes a similar stutter in German industrial production, which fell 1.8% in May, figures released on Monday showed. David Tinsley, UK economist at BNP Paribas, described the results as a “heavy dose of reality” after a run of upbeat economic data. “It is quite possible that the fall today reflects some erratic/seasonal influences,” Mr Tinsley said. Jeremy Cook, chief economist at currency company, World First, said the results were “puzzling”. In May, the Bank of England predicted that the UK’s economic growth would begin to slow in the second half of 2014, but governor Mark Carney said recently there were few signs of this happening. The pound fell slightly following the release of the manufacturing figures, as markets saw less chance of an interest rate rise before the end of the year.